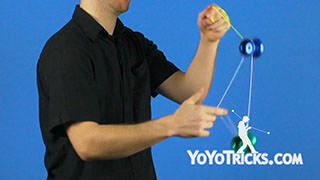 Learn how to do the Dawn Treader 3A Yoyo Trick. Just like that. Before you learn this trick, you are going to want to make sure that you have learned our other assisted 3A tricks. 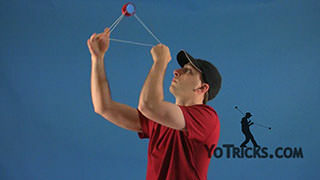 So you want to check out Assisted Front Mount, because it is really basic, as well as Assisted Brain Scrambler, and of course Assisted Barrel Rolls. 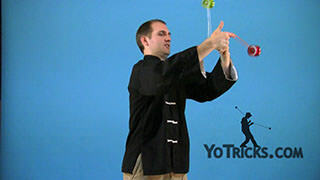 All three of those tricks have essential elements for doing this. 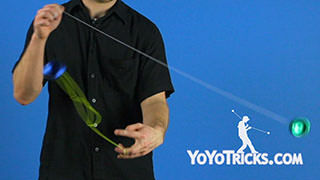 Each one also provides some essential tips on how to do assisted tricks in general. 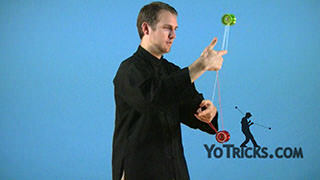 The Dawn Treader is one of my favorite 3A assisted combos, and I hope that by learning it, you will learn some different things about how to do assisted tricks that you can start putting them together in your own assisted combos, whether they are in front mounts or side mounts. 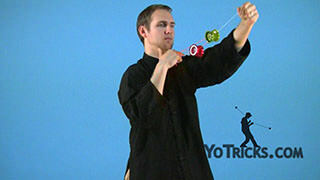 So, to get started, what you are going to do is you are just going to do an Assisted Barrel Roll. 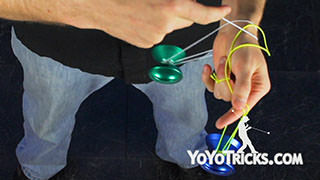 Start out getting into your Assisted Split Bottom Mount. You are going to do a Barrel Roll, do one, two. That is usually all that I do. If you want to do more, you have to make sure that it is an even number. 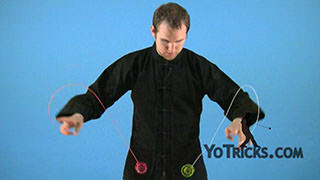 So you can do two rolls, you can do four or six, but if you do an odd number of rolls, you will find you are not set up correctly for the rest of the trick. Now from there, after you do your barrel rolls, we are going to get into Seasick. 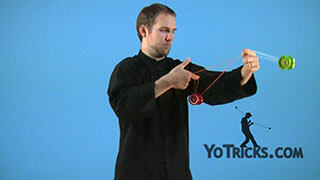 So it is a good idea to just, with one yoyo, make sure that you know how to do Seasick. 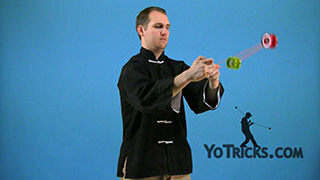 We have a 1A tutorial on this, so you can check that out. Just make sure you get good enough to be able to do one seasick motion. That is really all there is to it. 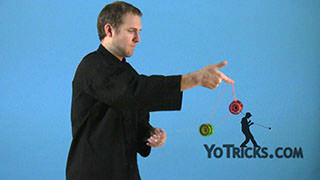 The next part, I will show you with one yoyo as well. Once you have actually done the seasick, you end up in an assisted Split Bottom mount. 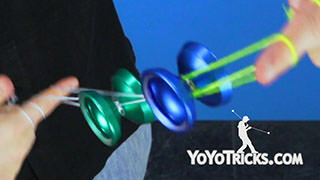 You are going to drop the yoyo out of the split bottom mount. It will swing forward and come back. 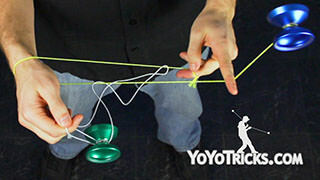 You are going to catch it on the string. 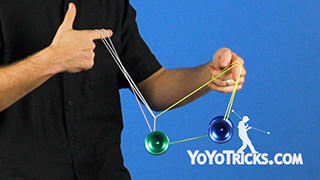 This is where you will get into an assisted front mount, just like this. 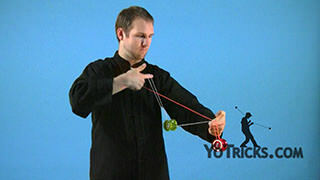 It is a good idea to practice this next part just with one yoyo to get used to it. 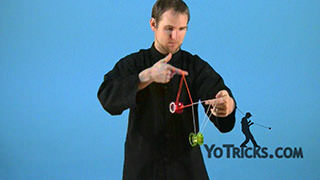 If you have not, what we are going to do is what is called the nunchuck. 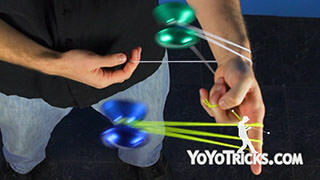 So you are going to do like a brain scrambler, go forward, and then to the outside of your arm. 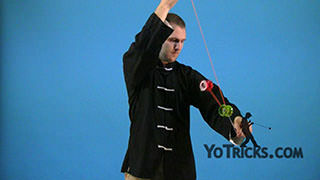 Then to the outside of your opposite arm. Then you can dismount and bring it back. 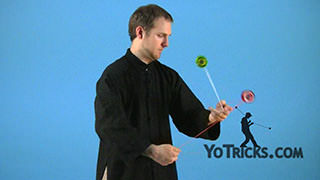 Of course, once you get used to that, you will want to put it into the assisted trick. So to do everything together, we are going to throw it in. Split bottom, one, two. 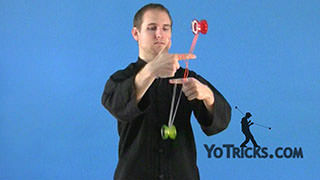 Do your single seasick, drop the yoyo. Mount it, forward, outside, outside, and then you can dismount. 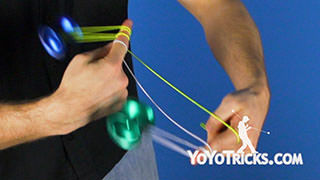 One thing to watch for when you are doing that last part of the trick, is that if you do not bring both hands over to the outside, you will notice that the yoyo that is helping do the assist will start to rotate because the strings are hitting the side of it. So you want to keep your hands in a nice good alignment. 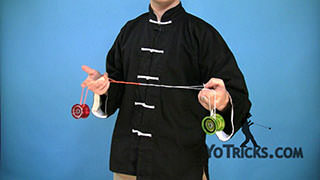 That will help keep it spinning straight, and will keep the spin going longer. Once you have got everything, you can put it together, and that is how you do the Dawn Treader.